Sunday August 13 1911 I helped care for Mother, rested and read some. A warm day. We did not have any company today except Will. Monday August 14 1911 A bright warm day I put in my time as yesterday Mother about the same. I am suffering with my throat & ears. 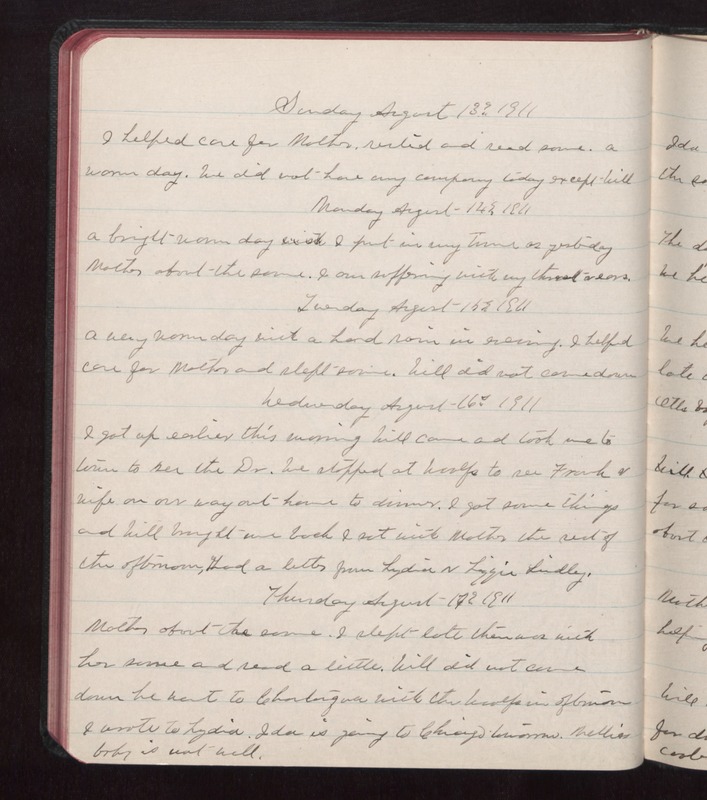 Tuesday August 15 1911 A very warm day with a hard rain in evening. I helped care for Mother and slept some. Will did not come down. Wednesday August 16 1911 I got up earlier this morning Will came and took me to town to see the Dr. We stopped at Woolfs to see Frank & wife on our way out home to dinner. I got some things and Will brought me back I sat with Mother the rest of the afternoon. Had a letter from Lydia & Lizzie Lindley. Thursday August 17 1911 Mother about the same. I slept late then was with her some and read a little. Will did not come down He went to Chautauqua with the Woolfs in afternoon I wrote to Lydia. Ida is going to Chicago tomorrow. Nellies baby is not well.